For years we have been attending our local Friends of the Bettendorf Public Library book sale every Spring and Fall. Our library amazingly offers thousands and thousands of books every six months for only 50 cents thanks to the donations of local residents. This doesn’t even include the thousands of magazines received and sold through the coffee shop every month. It’s the organization’s largest fundraiser and every penny goes to a good cause. For many years I kept my eyes open for books about military history. 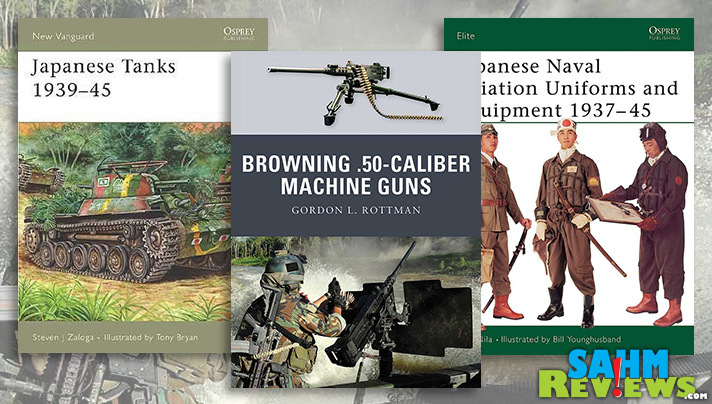 To be specific, books that were more of a reference type listing models of tanks and airplanes, or maybe guns and ammo. We have a close friend whose youngest son is fascinated with all things military and devours reference materials of this type. And for four bits, it was more than worth the smile on his face when we dropped off a couple he didn’t have. I still recall one small lot of books that were extremely detailed and concise. Among them was one about Japanese tanks, another covered Browning .50-caliber Machine Guns while a third featured Japanese military uniforms. Each of these answered every question about their subject that anyone could ever ask and are probably only superseded by actual government-issued manuals. At the time I didn’t give a second thought to the publisher, Osprey Publishing. Imagine my surprise when I found their booth at Gen Con! Sure enough, tucked into a corner of their booth was the familiar rack of military reference books. But they were exhibiting as part of their newest venture, Osprey Games. Still under the Osprey Publishing umbrella, Osprey Games is capitalizing on their knowledge of military facts and history to issue their own line of hobby-related board and card games. And no, these aren’t those dry turn-by-turn wargames your father played in the 70’s, these are every bit as new and unique as games issued by any other modern publisher! Here are some examples! It only makes sense for a book publisher to get their feet wet in the game industry by doing what they know best – make books! And in this case it was the Tiny Games series which covers multiple categories like Home, Work and Trips. Each of these titles challenges you to play a game using easily-found items in the home or workplace. For instance, in the Kids book, grownups are tasked with creating the tallest stack of hats on the child’s head in “Hat Tower”. Grab all the hats in your house and take turns trying to stack more than your opponents. This might be one of the only games out there that will actually get your kid to stand perfectly still! 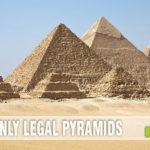 Fun travel games beyond the license plate game are listed in the Trips book. One of our favorites was “Stop, Stop, Sale, Sale” thanks to our music-inclined children. Pick a song that everyone knows and take turns winging a word. But don’t use the real words – find a word on a sign, point to it and sing that word. If you can’t sing it in tune when it’s your turn, you’re out. Last player standing (err…sitting) wins! These are but a couple examples of the dozens of family-friendly games you’ll find in each title, all playable with either things any household will have or by just using the environment around you. 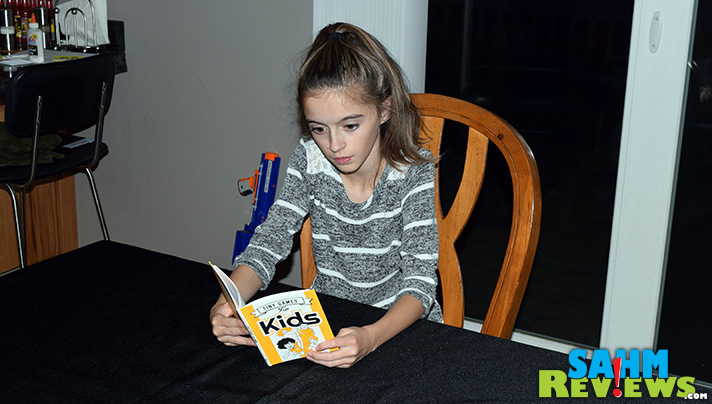 Available on Amazon for under $8 each shipped, these should make perfect stocking stuffers for the under-10 crowd! But save the “Work” one for me, there’s some really great games (and a prank or two) in that one! We’ve seen enough games that have a theme slapped on them as an afterthought. This is not the case with Osprey Games’ The Ravens of Thri Sahashri as it seems to have been designed as a game wrapped around a theme. Dripping with Japanese art and mechanics, it uses tarot-sized cards and challenges two players to cooperate to repair the heart of Ren, who has lost her memory. The other player takes on the role of the detective who must communicate with Ren through her dreams. 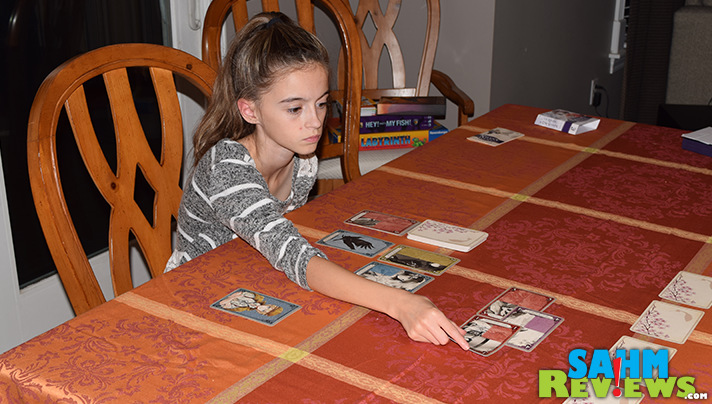 By playing a combination of cards and avoiding the Ravens (who destroy these memories), the detective tries to piece together the correct colors and numbers to match the face-down cards in front of Ren. They have only three rounds to accomplish this task or both players lose. A much more complicated title for ages 14 and older, it is also very affordable on Amazon for around $18. Expect an entire game to last around 45 minutes and be sure to watch the video above for a very well-done explanation of how to play. While the included rulebook is sufficient, this one is abstract enough that it is best learned by watching. 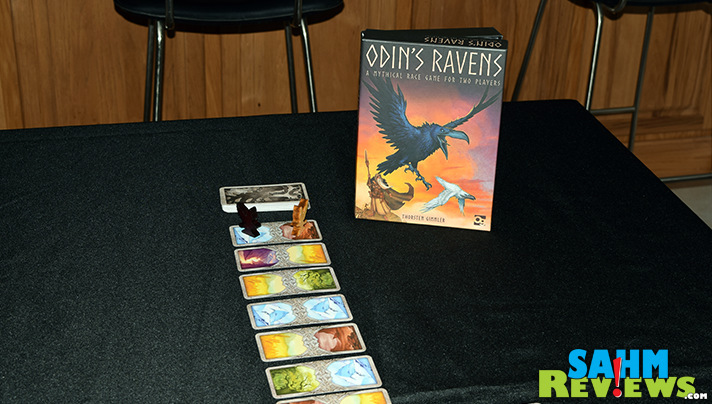 Of these three titles by Osprey Games, Odin’s Ravens was by far our favorite and a huge hit when we brought our copy to a local 3-day game convention. Also designed for two players, it can be explained and played start-to-finish in under 30 minutes! The first thing we noticed was the uniquely-sized playing cards with beautifully-done artwork. Included are three decks of cards, one for each player and one used to create the playing area. Setup is very quick – deal out 16 of the land cards in a long row, making sure there are no repeating images next to each other. 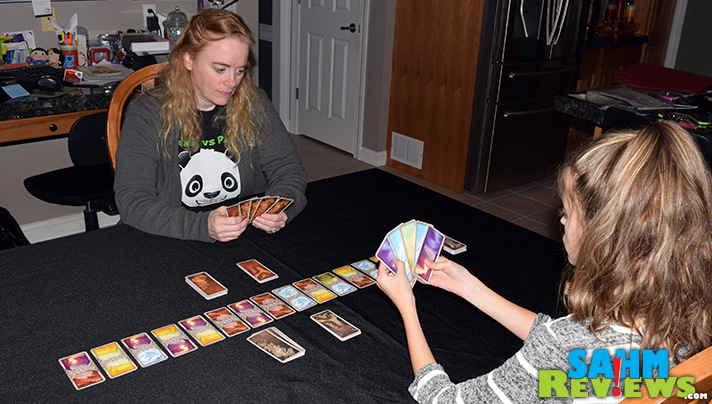 Each player shuffles their deck of 25 flight cards and 8 Loki cards and draws a hand of 5 from either deck in any configuration to begin the game. Your goal is to fly your ravens up and back down the opposite side of the 16-card ‘board’, getting to the end before your opponent. To do this, on your turn you play as many cards from your hand as you like, moving your raven forward whenever your card matches the scenery of the card in front of it. If there is more than one card that matches, you move forward through all of them by just playing the one flight card! All flight cards played are placed into a discard pile for reuse when the deck runs out. 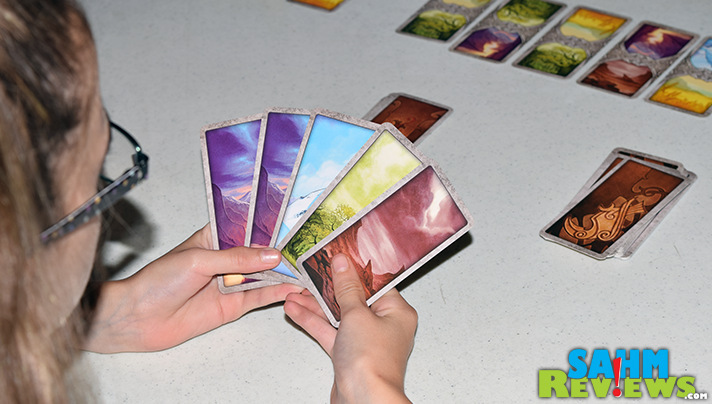 Both players have matching decks, including the eight Loki cards which allow you to change the board in different manners. 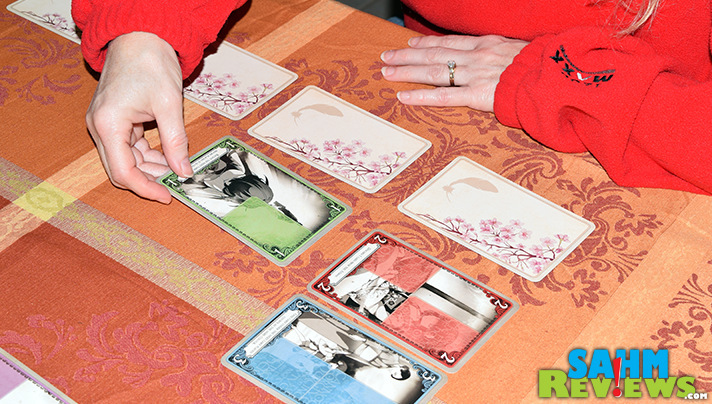 Each card has two options to choose from printed on it, and can only be played one time per round (discarded from the game when used). These cards might let you switch two land cards with each other, turn one 180 degrees or even draw extra cards on your turn! You can use more than one at a time, in any order you would like. But since they are only available once per game you must use them wisely. At the end of your turn, draw three new cards to your hand (again, from either the flight deck, the Loki pile or any combination of both). There is a hand limit of seven, so any you have in excess of that amount must be discarded. First person to the end of the opposite side of the track ends the game, with the other player (if they were second to go) getting one last turn. If both players make it to the end, the player with the most cards left in their hand wins! Currently available on Amazon for around $16, there is a ton of value in this very affordable game. Suited for most any age, it will probably go over great with the 8+ crowd as they will have a good understanding of the combinations necessary to eek out a win. 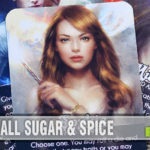 If these first game issues from Osprey Games are any indication of the quality and affordability of their upcoming game titles, put us down for one of each! Be sure to check out their Facebook and Twitter timelines for regular discount promotions and new product announcements. Our friends at Osprey Games have also offered to award a copy of one of their games to a lucky SahmReviews reader! 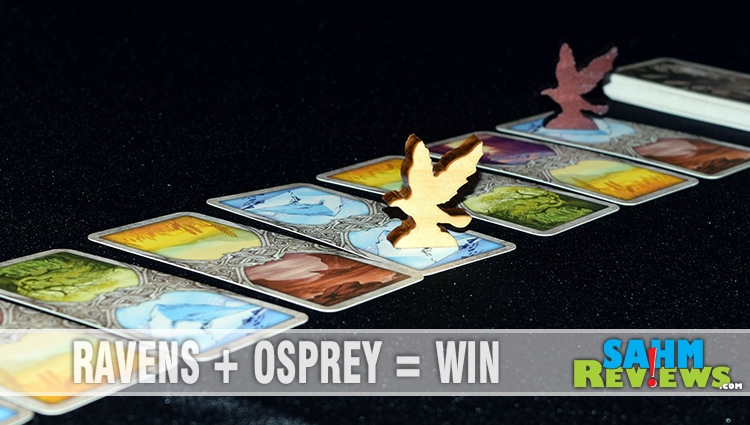 Enter below for a chance to win your choice of one of the Tiny Games books, Ravens of Thri Sahashri or Odin’s Ravens! Don’t forget to come back each day for more entry opportunities! Did You Know We Waged War in Canada? This is another cool looking game. I think let them eat cake on their site is the one that appeals the most to me. My mom loves this time period in history, and it would make a great game for us to play. Some great games there — thanks for the giveaway. Thank you very much! Odin’s Ravens looks great. Odin’s Ravens looks like we’d like it the most. I hope we win a copy to try! I love the artwork for Odin’s Ravens! It looks amazing! Odin’s Raven’s appeals to me the most with its amazing artwork! Great artwork on this one! 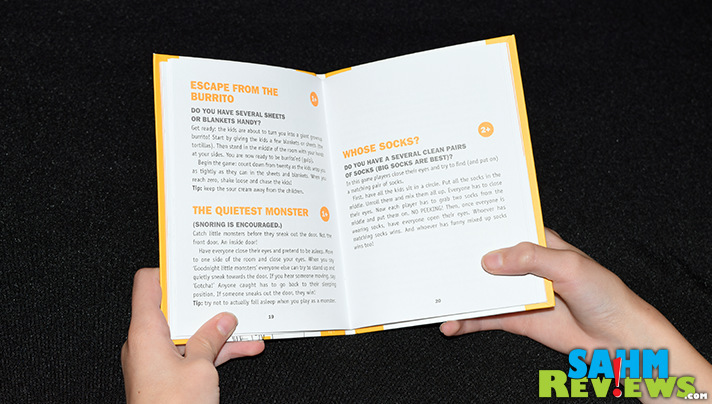 I’ve heard some good things about Odin’s Ravens but I think my little ones would enjoy the Tiny Games Books the best. I love all things related to Norse mythology so the game title caught my eye! I would like the Tiny games for kids. I really like the Odin’s Ravens.I think it would be interesting to play. I hear good things about this game. The Ravens of Thri Sahashri sounds like the perfect game for me and my girlfriend! I’m really interested in Odin’s Ravens. Thanks for the chance to win! 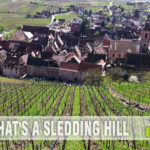 Looks like a fun game, thanks for the contest! I would choose The Ravens of Thri Sahashri, my son is most interested in that one. 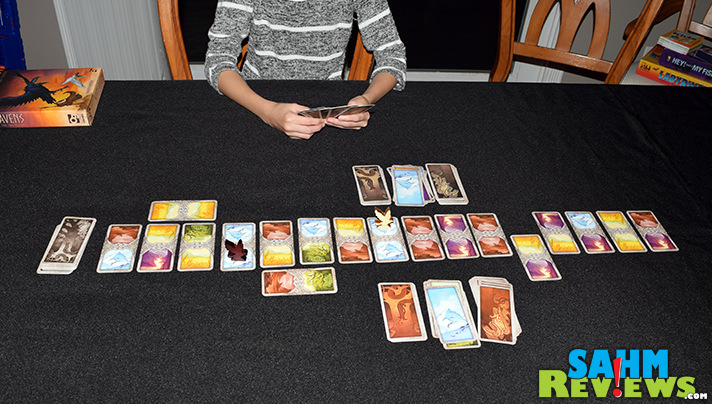 The Ravens of Thri Sahashri looks like a great co-op game for two. Very nice list… Odin’s Ravens looks interesting. A different kind of concept for a card game. I always loved the books. Odense Raven-yay another 2 player. I’ve never been much into card games but the Odin’s Ravens game looks rather interesting! Love the art on Odin’s Ravens! Ravens of Thri Sahashri is dreamy and surreal. This game looks beautiful! The artwork on the guards looks great.